Crystal Palace confirmed their place in the Championship play-offs with an easy win over Burnley at Selhurst Park. The Clarets were in trouble as early as the sixth minute when Clarke Carlisle was sent off for a professional foul. Ben Watson scored from the penalty and just two minutes later Victor Moses made it 2-0 for the hosts. Palace led 3-0 at the interval thanks to a Tom Soares strike, and goals from Scott Sinclair and Clinton Morrison completed the rout in the second half. 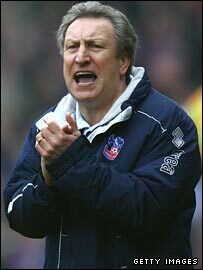 Relegation appeared to be the only route out of the Championship when Neil Warnock took charge of Palace in October. But they now have the momentum to make a miraculous return to the Premier League, and will face Bristol City in the play-offs semi-finals. Palace opened their account when a harmless looking goal-kick was misjudged by Carlisle and Sinclair stole in on his blind side. The on-loan Chelsea winger was set to shoot but was felled by Carlisle, leaving ref Kevin Friend with little option but to award a penalty and show the defender a straight red. Yesss, get in! Play-offs here we come!! Watson stepped up to smash home low to Brian Jensen's right. The visitors were still reorganising at the back when Sinclair collected a short corner to set off an a mazy run down the left. His chipped cross was half-cleared to Jose Fonte who headed back into the area where 17-year-old Moses was all alone and onside to guide a left-footed strike into the far corner. In the 37th minute, Morrison skipped round Jensen and pulled the ball back for Soares to slam home from inside the six-yard box. Palace continued to dominate after the break, and Sinclair made it 4-0 on 61 minutes. He picked the ball up on the left touchline, cut inside Chris McCann and then burst through two more tired challenges before drilling a low shot past Jensen. Morrison made it five just four minutes later when Watson again carved open the defence with a run and clever pass. Morrison kept his cool to slot past Jensen from just inside the area and usher in an exhibition of possession for the remaining 25 minutes. "I can't think of a better achievement in my career. To go from second bottom in November into the play-offs, never mind winning them, is a great effort from all the lads. "We have a 25% chance now and let's see what happens. It can come down to a lucky break or an individual piece of skill. "I've won six promotions in my career - but my lucky number is seven." "There is no getting away from the fact that for the first goal and the sending off the lad is five yards offside and the linesman didn't flag. "The two centre-backs should have dealt with it but they let it bounce and all of a sudden we're one-nil down with 10 men. "I've said before that you need good players and good luck in football and I don't remember one decision going our way." Crystal Palace: Speroni, Butterfield, Hudson, Fonte, Hill, Derry (Fletcher 59), Watson, Soares, Sinclair, Morrison (Scannell 72), Moses (Ifill 32). Subs Not Used: Craig, Scowcroft.